And we come to the big item, and probably the last major set of caves in the megadungeon – beyond this node most of the other nodes will be primarily “constructed” regions instead of natural caves. But today I begin tackling the “Vietnamese Cavern”, now renamed “Lost River Cave”. Like the Mushroom Cavern / Fungus Cave (whatever I ended up calling that node), this one is a small-scale map, with each square representing 20 feet instead of the usual 10. This makes this cavern enormous – and we’re only seeing the first page of it here. Standing in here at night with a torch, a party would likely see very little – even some of the “details” of this map are a few hundred feet across. However, in the daylight, the marvels of this cave become apparent. The elevated section to the east between the two rivers is directly below a large hole in the forest floor above it. About 180 feet above the highest point in the cave is a hole almost a hundred feet across where the forest floor gave way into the cave, allowing sunlight, birds and even trees into the area. Marshall’s sinkhole slightly to the west of the river entrance is the “easiest” way to enter the cave – a fairly steep descent down 50 feet of loose dirt and rock to a small hole below that leads into the cavern proper (still requiring another 20 or so feet of descending a less treacherous incline to get to the cavern floor). Explorers entering this way are best to hire someone to come check on their entrance point on occasion in case someone or something should come by and steal their descending ropes – the climb up can be treacherous. On the south side of the cave are four entrances leading to the “small caves” node. Starting on the far left we have the entrance used primarily by the ogres. Next we have a secret passage belonging to the rat folk which enters the cave 10′ below the ogre entrance. The next entrance is 10′ above the level of the ogre entrance and is the standard access way for the degenerate halflings known as the rat folk. Finally over to the far right we have a small river that flows in from the Cannibal Cave above the ratfolk tunnels. Another point of interest is this elevated area in the middle of the cave. Connected by a bridge to the Ogres’ access tunnel, the “Fortress” has a ring of heavy stones around the outer edge, allowing for a fairly safe vantage point over most of the area. With the ogres more interested in the dwarven ruins and having plenty of food from the mushroom caves, they do not maintain a guard or watch here, but come out here on occasion when they decide to pick on the goblins and halflings along the way. Finally we have “The Spires” which also act as a form of gateway between this section of the Lost River Cave and the deeper sections beyond. A collection of massive stalagmites and natural columns, this raised stone area truly shows the immense age of the Lost River Cave. 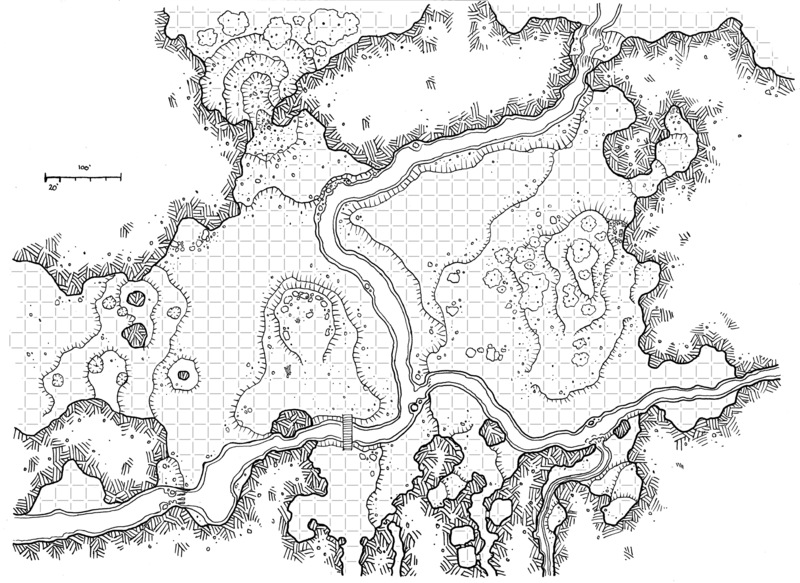 While the Lost River Cave is designed to go with the other maps of the Dyson Mega Delve, it can easily be used on it’s own. It is provided here free for your (non-commercial) use thanks to the awesome supporters of the Dodecahedron through my Patreon Campaign. Super cool. More importantly, thank you for impelling me to google Vietnamese caverns. In the same vein, I found Phraya Nakon, a Thai cave rather than Vietnamese, but my god is it incredible. Thank you.